Creativity - iNSTONE Easier 3D Printer inspires your imagination and wake your inner art talent. Easy Use - Mini 3D Printer Just needs by 6 steps you can make any items you want. All the operations can be done just with a knob. Portable - Light weight 5.3(lb) make you can easily enjoy 3d Printer diy everywhere and anytime whatever you are doing: working, preparing paper even cooking. Big discount on filament - You will get 40% off on our filament after you ordered iNSTONE 3D Printer Kit. 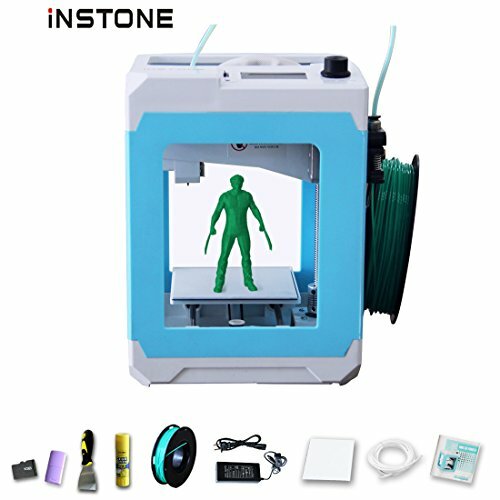 The INSTONE Mini 3D Printer boasts a 4.3x 4.3 x 4.9 inch, no need to leveling print bed, and an auto-calibrating extruder module which ensures the user gets the best possible prints.